At the opening of the new Village Hall in June 1991 a demonstration of various community sports and leisure activities was given. The most popular of these was Short Mat Bowls, and two months later the following piece appeared in the Old Mail. This truly “Green Game” is thriving in Cosgrove’s new Village Hall. A committee of 10 has now been formed and the game is played in the Hall on Mondays 2.30 to 4.30 pm, the first three Wednesdays of every month 8 to 10 pm and every Thursday at 8 to 10 pm. The adult membership (over 18) fee is £5 for the year but state pensioners can pay £2.50 for the year. Members pay £1 per playing session. Non-members are most welcome to play at a fee of £2 per playing session. Tea and biscuits are also available at 20p. If there is sufficient interest from parents who would like to accompany their children, junior sessions can be arranged, (say on Saturday mornings?). If you are interested, please ring Bob Entwhistle. There are three mats in the Hall and enough bowls to feed an Army (he would say that, wouldn’t he?)! Christmas has come and gone, Father Christmas is back in Lapland having provided the Club with enough funds to buy bowling carpets and equipment. He was ably assisted by those selling draw tickets and says “Thank you”. Added to this we have received grants from South Northants District Council and the famous Carnegie Trust, based in Scotland. A word of thanks to Jason Hart who has had a superb trolley made for the Club “Bowls”. Our Bowls Club Youth Group started on Sunday 23rd February supervised by parents (More parental supervisors are welcome!)…. At present Peter Simpkins and Jason Hart are helping to “run the show”. Bowls Club Committee members are attending to give coaching sessions. I believe the first aim should be for the youths to enjoy themselves, the second aim should be for them to form teams to challenge the “Aged Group” to a match! Any bets on the outcome?  watch this space  could be interesting! At present the session run from 5.15 to 7.15 pm on Sundays; they are operating on a trial basis till Easter. Some 124 Northants bowlers cruised down to sunny Torquay in December using luxury coaches. Fourteen of Cosgove's bowlers were in the group who were down for four days of excellent entertainment, food, fresh sea air and friendly competition bowling at Barton Hall. By 1993 the Club was going on trips to Torquay and also to the Algarve in Portugal. Teams were starting to get some wins in local matches. Team names were starting to appear  like the Robins and the Comets. Pat Styles and Val Inwood were chosen to play for Northampton County in the ladies pairs. Dances and outings to Torquay continued to flourish. The Youth Team were playing in the Nationals and the adults in County matches by 1994. Other villages were expanding Bowls playing and Cosgrove formed the Chicks team for Day players. A “Married Couples” trophy was presented by Margaret and David Barker  who then won it themselves. In 1995 championship wins were achieved  Cosgrove won the Crystal Cup, and beat Deanshanger in the GEC Triples with Donna Styles, Peter Styles and Bob Entwhistle. The following year in 1996 Albert Kightley and Brian Nye beat Phil Inwood and Dave Goldsmith in the National Pairs at Brackley, and all four Cosgrove players qualified for the England Trials. Brian Stephenson missed out to an England player by one shot in the National Singles. The Chicks were Day League Champions in Northamptonshire and the Cougars and Cygnets (a youth team) were formed. Cosgrove won the Crystal Cup for the second year running. Bob Entwhistle and Brian Stephenson won the Cambridge Open. Things were getting serious, but the real joy of the Bowls Club continued to be the social events and mutual friendship of Club members and families. In 1997 the Club lost their Chairman, Jim Rogers, who died in April. Despite this, in the Northants Short Mat Bowling Association awards Cosgrove won the Rose Bowl and the National Qualifiers Single Trophy with Bill Bell. Later, Ted Brown, Terry and Margaret Parker and Edward Sawbridge won the Potterspury Open. Spin off events began to emerge with the Club raising money for Willen Hospice and entering teams in other events like the village quiz. Seniors teams were always successful and in 1998 Jack Taylor, David and Margaret Barker and Bob Entwhistle won the County Over 60s Cup. Cosgrove’s bowlers were regularly visiting Potter’s in Norfolk at this time and Brian and Margaret Stephenson with Ted Brown won the Short mat Triples. Another blow for the Club was the death in February 1999 of Bob Entwhistle, their indefatigable bowler, organiser and social spokesman. The members rallied round and in May another spin off team, Phyllis Holman, June Moonan, Val Inwood and Daphne Jaynes won the County WI tournament trophy representing Cosgrove. Into the Millennium year 2000 the Cougars, Robins and Chicks all won their respective Leagues and Cosgrove won NSMBA trophies for First Division, Southern Evening League and Central Day League. Cosgrove’s players continued to gain honours despite difficulties in attracting new members  a common problem in local clubs at this time. 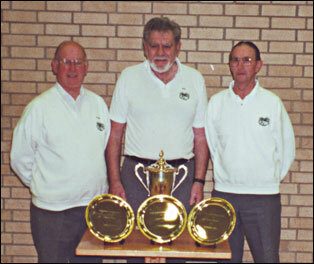 In 2001 Albert Kightley, John Shervington and Eric Upton won the Dave Jones Trophy  a County Open. This same team with Ted Brown won the South Northants Council Tournament. Ted celebrated his 82nd birthday at the club in 2002 and with Den Tompkins, Laurie Lawrence and Eric Upton won the Earl Spencer Cup! In 2003 the Day teams were bringing home League Trophies but the evening teams were slipping down the lists. Social and fundraising events continued to thrive. 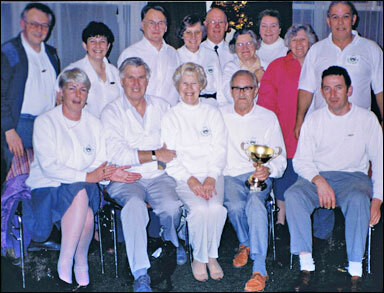 In 2004 the Crystal Cup returned to Cosgrove after eight years and Margaret and David Barker, Janet Taylor and Brian Stephenson brought home the Earl Spencer Trophy and retained it in 2005 and 2006. The various teams moved up and down the Leagues over the next few years with the Comets mostly represented in the Premier League. The lack of regular players in some of the teams was hampering success as was the depletion of youth teams. In 2007 the decision was made to reduce the number of League teams. 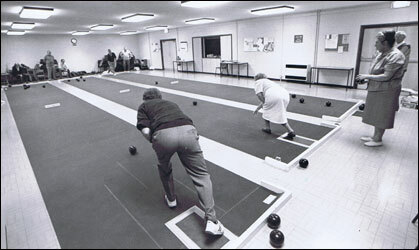 Some Club matches were forced to cancel through lack of support, but Cosgrove’s elite bowlers still managed to retain the Earl Spencer Trophy in 2008 thanks to Janet Taylor, Margaret and David Barker and Ann Onan-Read and in 2009 the Comets won the Division One League. Illness dogged the Club in 2010 and only one Evening team continued. Reporting in the Old Mail ceased in 2011 but in 2014 the Club continues to play in the Village Hall on Monday afternoons and attend matches whenever fixtures are arranged.